It’s National Home Remodeling Month—Have You Seen These Posts? May is National Home Remodeling Month, and Eye on Housing recognized the occasion with a series of posts on home remodeling. As the month draws to a close, we provide a list of those posts for anyone who may have missed them. Also, shortly before the month started, NAHB’s quarterly post on the Remodeling Market Index appeared as usual. And don’t forget that an up-to-date chart and discussion on the amount being spent to improve owner-occupied housing appears every month as part of NAHB’s post on Construction Spending. Finally, beyond the blog, NAHB’s main web site contains a number of National Home Remodeling Month Promotional Materials. NAHB just released new estimates of spending on improvements to owner-occupied housing by zip code. The estimates are based on a model relating improvement spending to five key variables (number of homes in the area, the share built in the ’60s, share built in the ’70s, owners’ average income and level of education), projected to calendar year 2014. As before, the estimates show total spending on improvements, as well as spending per home, in each zip code. On average, total spending on improvements in a zip code is projected to be about $5.1 million in 2014. The top 5 total-spending zip codes are all in Maryland, Texas, or Illinois. Each of these top 5 zips contains at least 15,000 owner-occupied homes and home owners who average at least $145,000 in income and are 60 percent or more college educated. Most of these top 5 zips don’t have an unusually large share of homes in the key vintage for remodeling (homes built from 1960 to 1979), except for the zip at the very top of the list—#20854 in Maryland, a close-in suburb of Washington DC. 20854 is the only zip where over $60 million in spending on improvements is projected for 2014, and over half the owner-occupied homes in that zip were built 1960-1979. 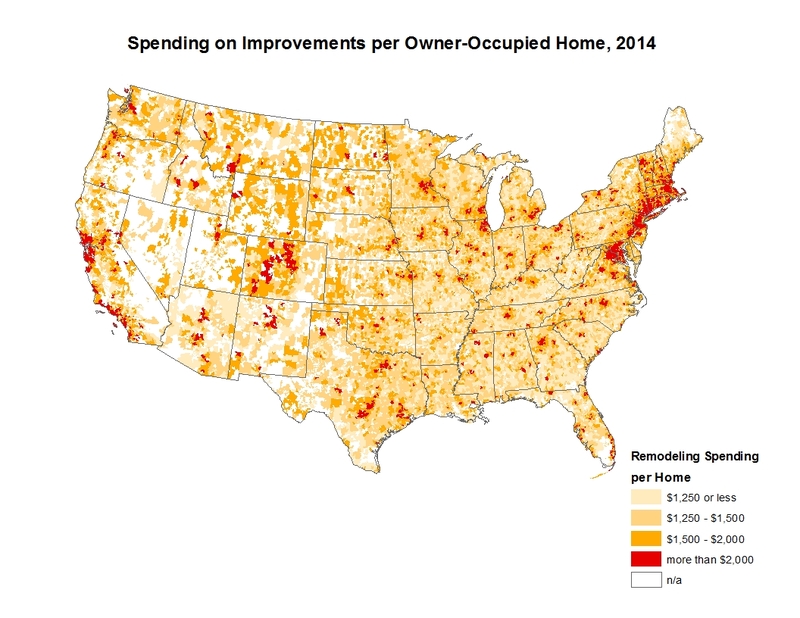 The map below illustrates improvement spending per owner-occupied home. In the average zip code, improvement spending per home is just under $1,600. The top two zip codes by this measure are the same as they were in 2013: #94528 (in a suburb of San Francisco) and #10007 (in Manhattan). These are the only two zips with projected spending per home of over $5,000 (even over $6,000 in 94528), although several others come fairly close. This year, unlike last, a zip code in New Jersey cracked the top five—#07078, a suburb within commuting distance of New York City. Homeowners in the top 5 improvement-per-home zips are at least 92 percent college educated and have average incomes of at least $350,000. Nearly half the owner-occupied homes in top zip #94528 were built 1960-1979. Energy efficient windows emerged as the leading green product among remodelers responding to NAHB’s Remodeling Market Index (RMI) survey for the first quarter of 2014, as nearly 9 out of 10 remodelers surveyed said they’d commonly used low-e windows during the past year. Next on the list were high efficiency HVAC systems and programmable thermostats at 70 percent each, closely followed by ENERGY STAR appliances at 69 percent. Although the features at the top of the list all involve energy eficiency, the term “green” is usually defined more broadly than that. Moisture control, for example, is classified as green here, because it results in some components of the home needing to be replaced less often, reducing environmental impacts associated with manufacturing, transporting and installing those components over time. 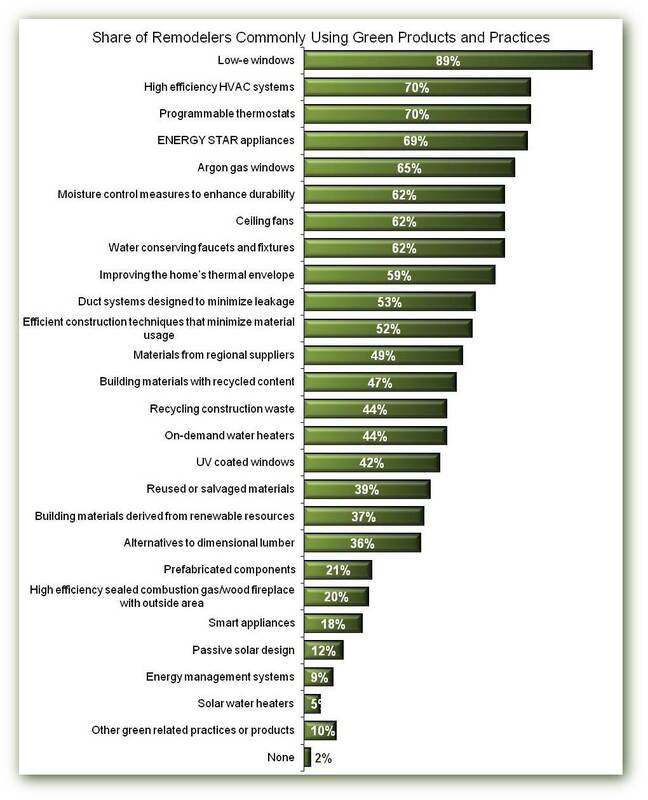 The list of 23 green products and practices used in the RMI survey is based on the major sections of the National Green Building Standard (which can and should be applied to remodeling as well as new construction). Given the difference in cost, it’s perhaps surprising that use of program-mable thermostats is no more common than use of high efficiency HVAC among remodelers. Anecdotally, several NAHB members have reported that a small but discernible share of their customers tend to resist devices that require programming. A similar result was found in a survey on green products and practices used by single-family builders. 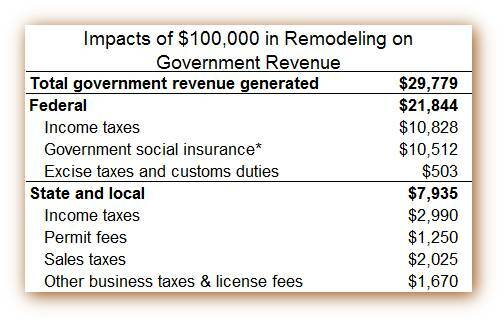 It’s also interesting that, across the two surveys, the same four green features appear at the top of the list and in the same order for both remodelers and builders. The remodelers’ percentages tend to be a little lower, but this is natural, because not every remodeling project involves every home component. High efficiency HVAC systems, for example (the second ranked green feature for both builders and remodelers) are commonly used by 90 percent of builders, compared to 70 percent of remodelers. But remodelers who specialized in projects like replacing windows or building decks in 2013 may have seldom if ever needed to install HVAC systems, while builders of new homes would have, at some point, dealt with every aspect of HVAC. A previous post discussed hiring a professional remodeler, with an emphasis on those remodeling projects (like roofing or HVAC work) that most often involve homeowners hiring a contractor as opposed to attempting it themselves. This one deals with the choice of a particular contractor. In particular, the question asked customers to rank the importance of five contractor attributes on a scale from 1 through 5 (1 being most important; 5 least). 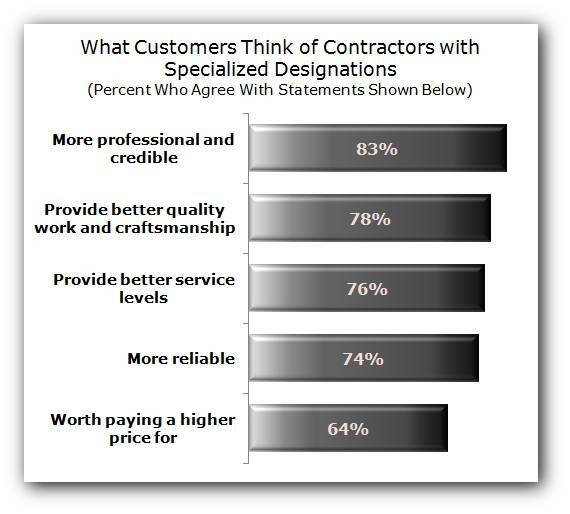 “Reputation for quality construction” easily came in first, ranked most important by 45 percent of customers—over twice the “most important” percentage for any other attribute on the list. This naturally leads to a question about what a remodeler can do to achieve a reputation for quality. One possibility is to acquire one or more specialized, professional designations (credentials awarded by trade associations or government organization certifying expertise in a particular area.) NAHB has several such designations for remodelers, including Certified Graduate Remodeler, Certified Aging-In-Place Specialist, Certified Green Professional, Master Certified Green Professional and Graduate Master Remodeler. It is National Home Remodeling month and NAHB wants to emphasize the benefits of hiring a professional remodeler. There are two aspects to this: 1) hiring a contractor rather than attempting a project yourself, 2) hiring a contractor who is a well-qualified professional remodeler, such as members of NAHB Remodelers or those who have earned one of NAHB’s Professional Designations. According to 2011 American Housing Survey (AHS) tables from HUD and the Census Bureau, over 60 percent of home owners hire contractors for home improvement activities overall, but the share varies depending on the activity. 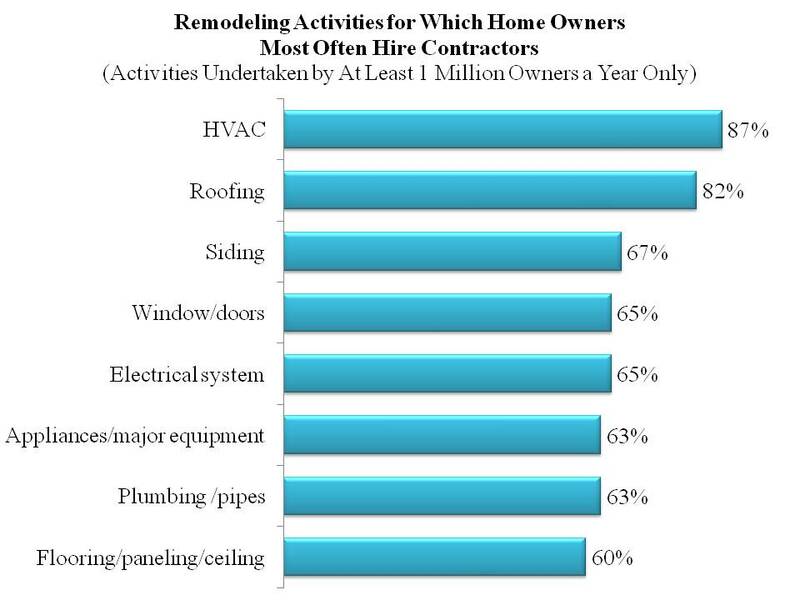 At the top of the list among activities undertaken by at least 1 million homeowners a year, 87 percent of owners hire contractors for HVAC jobs, followed by roofing jobs at 82 percent. On a dollar basis, the shares would be significantly higher, as owners tend to hire contractors for larger projects (see previous post). A leading reason NAHB recommends home owners be careful about attempting projects on their own are safety, as lack of familiarity with tools and techniques can lead to serious accidents. Working on a roof is often cited as an activity with the potential for serious injury. Another reason is cost, as home owners may forget to factor in the cost of tools. Many remodeling projects require specialized tools, which a home owner will purchase and only use once or twice. Cost of a project, of course, can also escalate if it is done incorrectly the first time and therefore has to be re-done. An advantage of a well qualified professional remodeler is experience with the appropriate tools and specialized knowledge needed to perform correctly. HVAC work is an example of something that can’t be done by everyone and requires specialized knowledge, for example to size a unit correctly for a particular home. A follow-up post next week will cover what homeowners look for in a remodeler and what they think of remodelers with professional designations.